Echidna is ancient Greek and means 'she viper'. The monster was half-snake half-woman, and was also called 'Mother of All Monsters'. In Greek mythology she was indeed the mother of all monsters, including cerberus, gorgon, scylla and chimera. 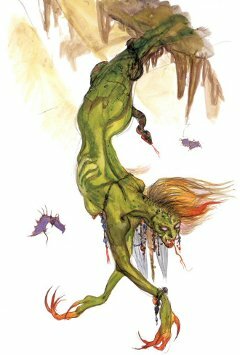 She was described as an undying nymph living in caves deep beneath the earth, fair of face and horrid with her speckled snake's body. She also ate raw meat. HP: 9,130, MP: ?, ATK: 142/M28, DEF: 4/M33, EVA: ?, SPD: ?